Bridge Systems have many years experience designing networks; When designing a radio network or microwave system, Bridge Systems' survey team will carry out propagation surveys as part of the project so as to determine coverage and link path analysis. Mesh network gives you the convenience of a wired network switch combined with the deployment flexibility of wireless network technology. A Mesh network can be set up and deployed in a matter of minutes with little effort or alternatively be laid out as a permanent part of the infrastructure of a site, factory, warehouse or city in some cases. The mesh consists of a number of ‘nodes’; these are small transceivers that connect to each other wirelessly. Each node makes multiple connections with any other nodes that it can establish radio communication with. The software that each of these nodes runs constantly monitors each of the connections to find the best and most efficient path for the data to flow through the network. 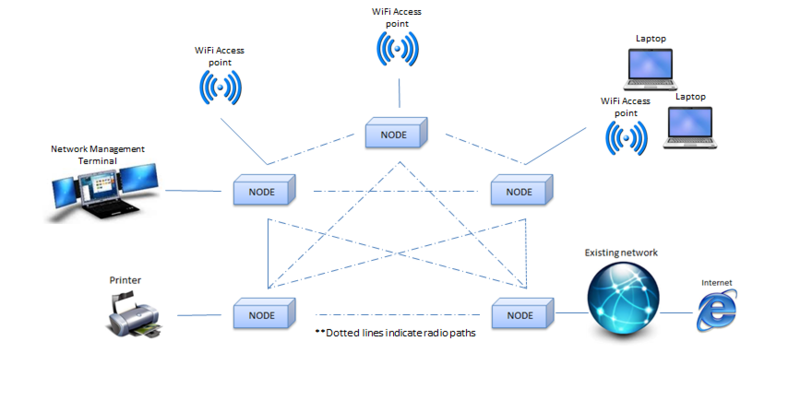 If a node is lost through a power outage, becoming faulty or if the radio path is compromised, the software recognises this and reroutes the traffic accordingly maintaining the operation of the network. The same principle applies when you add new nodes into a system. All of the mesh nodes come with easy to use, intuitive management software packages for the configuration and running of the network. This software would be loaded onto a terminal that has an IP connection to one of the nodes in the system. Real time monitoring is available to ensure the optimal operation of the network and also to identify problems in the event of a fault. We have networks operating bandwidths from 768kb to 1Gb in various frequency band from 1 - 80GHz. Microwave has many benefits, it is quick and costs effective to deploy with no expensive rental costs. Microwave transmission is the transmission of data (this can be voice, visual or any kind of data) by electromagnetic waves which are measured in small numbers of centimetre; these are called microwaves.